Years ago the only fascinating piece of technology we had was a camera (size of a lunch box) which spits out the photos instantly on clicks rather than getting them developed and take weeks in the crappy dark studios. #polaroid cameras were like a magic for a magic.but with the latest DSLRs and cheaply available photo pieces of equipment they evaporated quicker than expected because of their bulky designs and low picture quality may be. We were looking to explore this kind from a long time and this time the biggest brands of all Polaroid came to the rescue and awarded us with the opportunity to try out their latest design for the loved-by-all polaroid cameras. The camera works by using a built-in ZINK printer. ZINK paper has ink crystals embedded inside, which are activated by heat. That means you can print a photo by only reloading the paper, no ink necessary. That allows Polaroid to take a digital photograph and spit out an instant print while still making the camera compact. the perfectly crafted Snap camera gets full marks on the design aspects with very easy to operate with an almost perfect 3.5 inch LCD touchscreen, features without making it hard and confusing on the features only a single snap button the build along with a flashlight which also acts as a power on button, and a slot to accept Micro SD card(up to 128 GB) the body is available in different colors to make it funkier than it already is. ZINK® Zero Ink technology for instantly printing photos – comes with a pack of 10 sheets with the camera. the SnapTouch allows us to share the pictures and videos with the Bluetooth as well as with the memory card option.the operation is pretty straightforward with a pack of 10 sheets which you put by opening the touch screen slot (there are few important steps which we will cover in our youtube video review) and then focus the subject on taking the perfect picture and just print so that it goes on your wall. New PhotoBooth mode to get your crazy expression perfectly. Built-in Bluetooth and a Polaroid app allow users to share electronically without a computer as well. SnapTouch being a very handy and happy camera works really well on the promised features, however, fall short on some details like the picture quality and the light sensor. if the context is just about clicking your moment and having them instantly to physical form, this is the one for the job but we are not expecting that you can win a photography competition with this one for sure. All, in All with this happy camera you will really enjoy that next vacation you have in the plans. You can buy the SnapTouch from amazon from here. Please send us your comments and we can get you some special discounts on the products we review. its the best instant camera ever! Wow, thank you for such an informative review! This instant camera looks awesome! I love that with this camera you just reload paper and NO INK is necessary!! I love instant cameras! I don’t know how it works with no ink but thats the best part! my favorite part about this is you can print it as soon as you take the picture, i always forget to print my pictures after i take them so they just stay pilled up on the computer or phone. this would be amazing and i would not forget. I’ve personally always wanted one of these..!!! the pictures come out beautiful and its sonconvenient..! you dont have to wait for them to be developed and pay all that money for your pictures ..!!! totally worth the investment..! I love that you can get the pictures so easily and not have to go get them developed. The camera looks so easy to sue too. i loveeeee instant camera as I’d love to stick every moments in my room so i can sleep peacefully knowing that i’m feeling happy. It’s amazing how so much can fit in so little this camera can do it all! Wow! Really want to try it myself! I’m fascinated by the Zink printer inside this camera. I am going to keep coming back to read about this camera! I love it because is simply and wonderful! This sounds aweseome! Snap, print and share! Very nice! Thank you! I love this camera, it takes me back to my childhood when we had the old polaroids! Love it already , this is great since I always forget to print my pictures and they mostly stay on my sd card ? I recently saw one of these Awesome Polaroid SnapTouch Cameras when I was doing my Christmas shopping, and I was immediately intrigued. So you can imagine my curiosity, when I saw the post for your review of this magical machine. Obviously, I had to check it out, which led me to your very descriptive and well written review. After reading your very detailed review, I’m 100% convinced that this is the Camera for me. I also think that it is just wonderful, that Polaroid has offered to have you throw a Giveaway for one of these magnificent machines, and would be ever so grateful if I were to win this Amazing Giveaway. Last, but most definitely not least, I want to Thank you so much for leaving this really great and in-depth review of the Polaroid SnapTouch Camera, it has definitely helped me to realize that this is the Camera for me. I’ll definitely be getting one of these for myself, although it sure would be really cool, to just win one. But, either way, I will own one very soon. Thanks Again & God Bless! Hi Arian.. thanks for your appreciation we loved your comment! Thanks for your review. This would be great to have for get-togethers and celebrations, but with the limited picture size and limited photo quality, I’ll still keep my main digital camera, too. So cute – what a great idea! The benefits of a digital camera and the convenience and fun of a Polaroid, all in one! The printed pictures will be even better when you can see a digital shot, first. What a great review! I really want one! Many years ago, I had the original Polaroid camera. The first picture I took was of the Beetles performing on the Ed Sullivan show. I’ll never forget the “magic” of that moment when the camera printed that instant black and white print! Needless to say, Polaroid has come a long way in developing their instant cameras. What I like most about the Snaptouch Camera is the fact that you never have to use any ink. I also love the idea of the Photo Booth mode. What fun! your review is in-depth, comprehensive, and tells me everything I want to know about this camera. If I don’t win one, I’ll be purchasing one for my grandchildren. Thank you so much for your comments Diane! Love the high tech app for instant results! Great review. I would love to have one. Very nice features, I like the stylish design. Great camera since you can get your pictures right away. Awesome camera. Thanks for the chance. I have always loved Polaroid cameras, I really like the idea of an instant photo.This updated version of the classic rocks! I really want one. I remember the old Polaroid instant camera love them. Hope to win this. I love the camera! Really highlights the features. Thank you for the opportunity! This would be so fun for myself and my grandchildren. We could have a blast with it and they would be learning about photography all the while too. I love Polaroid cameras. This one would be nice. This camera would be A Dream Come True. I hope that I win to take wonderful pictures of my family, friends and Goldendoodle. This looks amazing. I would love this for my family. Really! I would love this to snap tons of pics of my Sweet grand babies , they grow up so fast , i love that its so simple to use perfect for me 🙂 thanks for the awesome review and the chance to win ! I would think this is a specialty camera for use in unique situations. Weddings, for example. Never too many times when I would want to have the picture “right now”. Would be nice to have on vacations. Especially when visiting older relatives. Give them the picture right in the moment. the best cam ever hoppe i win !! i want memories that will last and a camera that is trustworthy–this fits the bill. thank you for a perfect opportunity to own this. I’ve seen and heard a lot of reviews about the Polaroid SnapTouch; this would be wonderful for my younger kiddo who has taken to photography. He loves to capture his world, life and friends and this would be a great way for him to do that. Thank you! This is a wonderful review, thank you!! I would love the #PolaroidSnaptouch because I love photography and it would be amazing to be able to get my pictures that fast! I love going kayaking, hiking, etc., and taking beautiful scenery photos, and then I also love taking photos at all of our family gatherings. Photography = happiness. I love taking photos and this is perfect. You know it’s a great camera because of the brand. I want this Please !!! This is so cool! I really want this camera! So I can bring it to concerts and different things I go to. I can’t believe they have brought it back it’s smaller than the other one but I can’t wait to try it. I grow up getting my picture taken by one. When they stopped making the film for their first camera we all were upset and couldn’t believe it they were great cameras. I still have one. Thank you for making were my kids, kids get to enjoy them too. thanks Neerja and we hope you do win! I was first interested in one of these Polaroid Snaptouch cameras a few months ago but wasn’t sure about all the specs. I love photography and I am never seen without a camera. I guess I am old school and grew up with Polaroid and I love that Polaroid is showing that they still are leaders and are innovative. Your description of this camera has made me know that I want this camera and that is why I keep coming back and reading about it. Oh sure, there is a contest going on and of course I want to win (LOL) but I keep wanting to know more and more about this Polaroid Snaptouch camera as well. Thanks for the great review! I love taking photos so I know this camera would be my new bff! Thanks for the great review! This is awesome. Love the idea. Even though I loved my old Polaroid, I would love to have one of these. OMG I have to have this! ??? these cameras look adorable, that’s what drew me in, but i found myself fascinated by their operation…great review! I love this Polaroid snaptouch it’s lightweight, plus theSD micro makes it awesome I can save my pics for later, all these amazing features will have me taking shots and scrapbooking them or sharing it. I can see us having lots of fun together! Thank you for this awesome review. This instant camera looks great. Thanks for the giveaway! What an awesome review! It’s so cool that the camera comes with it’s own built-in printer so that I don’t have to worry about going home and sending someone a file or picture. Now I can just hand it to them right after I take it! I have an instax mini camera, but the problem with that is that if your photo isn’t quite right you have to either lump it or dump it! This one looks awesome cos you can check your shots before printing. This is a great opportunity to print out a pix for a friend while you all are still together. We can share a hardcopy of the pix and enjoy it. I would love one! Your review is fair, but I think the positive far outweighs the few negatives you had. Thanks for the review…I can buy one with my eyes wide open. thanks for your comments debra! Honestly such a great piece of equipment and an awesome investment! A mix of classic vintage and ultra-modern sophisticate. Its sleek and cute exterior is what sets it apart from the rest of the bulky and boring cameras out there in the market. Not only is it such an eye candy, the camera is not just an ordinary camera; it’s a SMART CAMERA. With features such as that, the camera is totally worth a dime. It’s a must have piece of gadget. Nice on my list for my birthday! I have been looking at Polaroid cameras for my birthday/big trip I have coming up. I really appreciate your review! WOW, Polaroid cameras sure have come a long way from when I was a kid! I wanted one then and I still want one now! I really want this! It’s an amazing product! 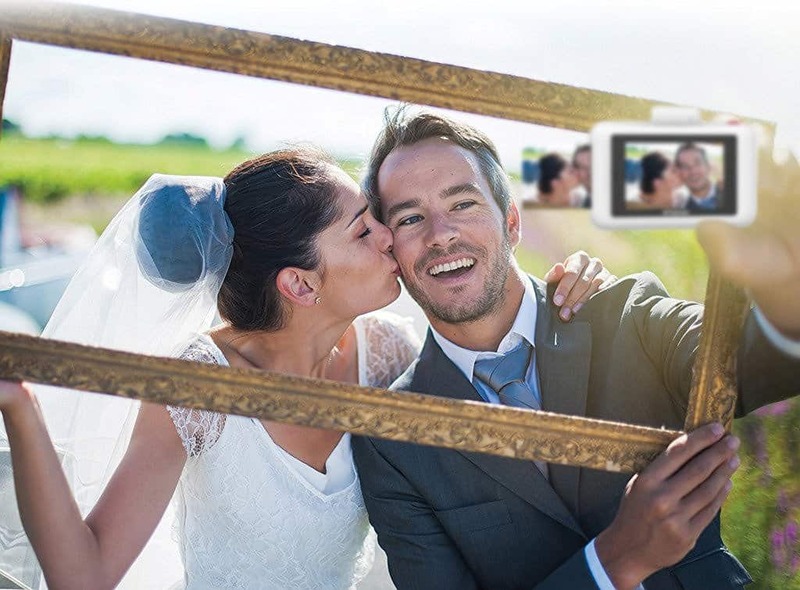 Instantly capturing moments (re)made easy. 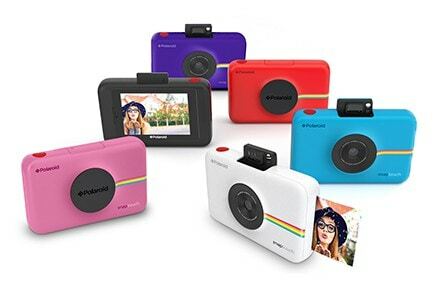 The nostalgic Polaroid perfectly blended with update modern technology in an attractive pocket sized package. Nice innovation by Polaroid to keep up with the latest trend!! The design is cute and awesome. This awesome camera is one of must have item. Thanks for the great information! I would love to have one of these since the only camera I have is on my phone and it isn’t so great. What a great camera! I love instant photos. I bet at 13 megapixels this takes some really awesome shots! Great review. Absolutely love this camera as it looks so fun,easy to use and can save/print all your wonderful memories in an instant. Would love to have one of these beauties. Camera seems great but what are the running costs? One of the plusses for digital photography is each piccy is effectively free once one has the kit and we have got out if the habit of paying for photographs. the zink printing papers are really cheap in the market which makes this a good one to have. amazing giveaway, I had a mythical little Polaroid and I remember it with much affection, I always wanted one of these, thanks for the opportunity! It’s the perfect size to carry everywhere and had great features! My daughter has wanted one since they came out but I am a single mom & it is still to far out of my budget. Winning would make her so happy, she loves taking Selfies & photos of her friends…printing instantly is what she really wants!! The lens is the winner for me! I really like how light weight it is. This would be great to have. I love this camera, It’s so cool!! I like that the Polaroid SnapTouch has a built-in Bluetooth and a Polaroid app that allows users to share their photos. I also like that it has a PhotoBooth mode. My tween would love it. Polaroid SnapTouch sounds like a great camera. Old school meets new school, I love it! Thanks for reviewing! Oooh very cool, I love that it has Bluetooth and frames and stickers! Especially love the pink and the white and the baby blue! I liked how detailed this review was. You mentioned all the features of the SnapTouch in it as well as the positives and negatives of the camera. I like the SnapTouch because you don’t have to worry about having ink in it to print out a picture. Plus, I like that the Built-in Bluetooth and the Polaroid app allow you to share pictures electronically without a computer, too. I also like that the SnapTouch comes in different colors. It certainly seems to be a stylish little camera! Thanks for the fantastic opportunity to win!